The late August day was a typical day for the time of year. With the clouds covering the early morning sun and a light cool breeze blowing it felt almost like fall. Then the sun would peek from behind the clouds and and the humidity would reappear and one was reminded that summer is not quite over. This went on all morning as if the day could not make up its mind as to what to do. I had a few hours and wanted to get a line in so I took a ride over to one of my favorite local spots. The river was a bit muddy from the hard rains a few days before and was running high, especially for this time of year. I knew the water would be warm so I left the waders at home and went wet wading. With the water being warm, I knew the trout wouldn’t be biting if there were any still around, so I hit a spot that is also known to contain some bass and other panfish. As I walked down to the river I could see all the mess that the heavy rains and flooding made. Trees were across the river and the trees in the river were completely uprooted. I knew that it would mean more lost flies and more time at the tying bench this winter. On the positive side it provides great habitat for the fish. As I was surveying the river to figure out what fly to use, I looked through my fly boxes for inspiration. I came upon a fly that seemed to fit the bill. I chose an Egg Sucking Leech. I know, it sounds like something you would call your ex, but no, it is actually a thing. It is a fly with a little round ball on it in a bright color, usually red or pink to look like a fish egg. The body of the fly is a feather to look like a leech and the body of the leech has a little flash on it that reminds you of Christmas tinsel in order to stand out. 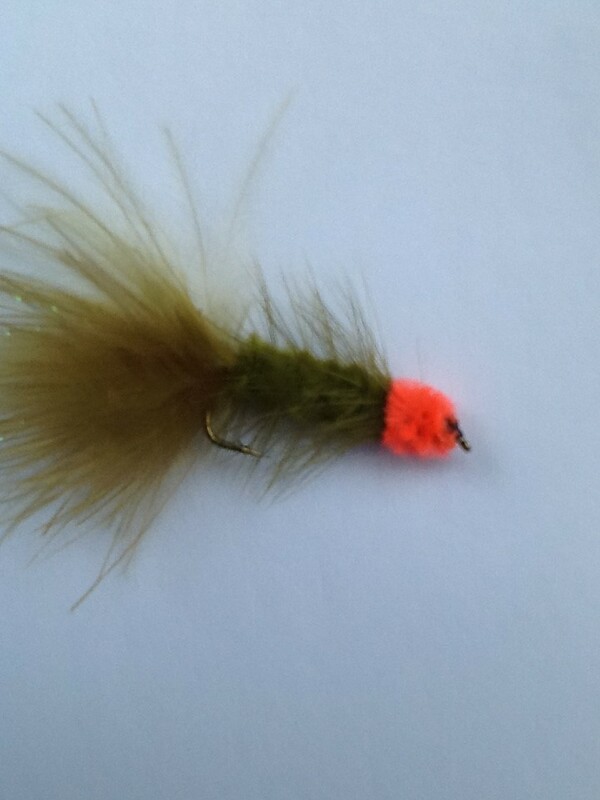 I chose this fly because it is a go-to fly that a fish can see in brownish water. As I was tying it on, my mind got to wandering as it often does. I had limited time and I knew the fish might not be biting so I was thinking of what I could do to make things more interesting. Then I remembered that in Jackson Hole, Wyoming they have a fundraiser called the One Fly tournament. The basic rule of the tournament is that you have to choose one fly to fish with all day. You lose the fly, you are done. You have to try and catch as many fish as you can. So I thought I would give the one fly a try. I tied on my Egg Sucking Leech and began to ply the waters. I was on autopilot as I would cast and retrieve, take a step down river and cast and retrieve again. A number of ducks were flying up and down the river as if to try and figure out if they wanted to go North or South. It seemed as if the sun would come out and they would head north, the clouds would come and they would head south. Then as I was retrieving my fly it seemed to get stuck on a branch. I applied a little pressure and then the tip of my rod began to dance and I realized I had caught something. Whatever was on the other end was good sized. As I reeled it in the rod tip began to bend. After a few minutes I had the fish beached. I had caught a 15” Fallfish which is basically a chub or a sucker fish. A few minutes later I caught a small mouth bass. Then it was time to go and I still had my fly. 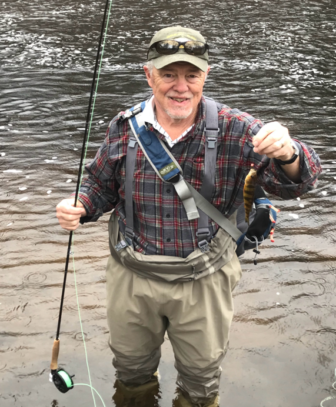 As I broke down my rod and got into my truck, I thought about the One Fly Tournament in Jackson Hole and fishing for Cutthroat Trout instead of Fallfish in Dover and decided that it probably would be lots of fun, and maybe someday I will. For now I wonder if any of those fly fishers have caught a 15” Fallfish.